SONY launches PlayStation Classic mini console with 20 pre-loaded games. 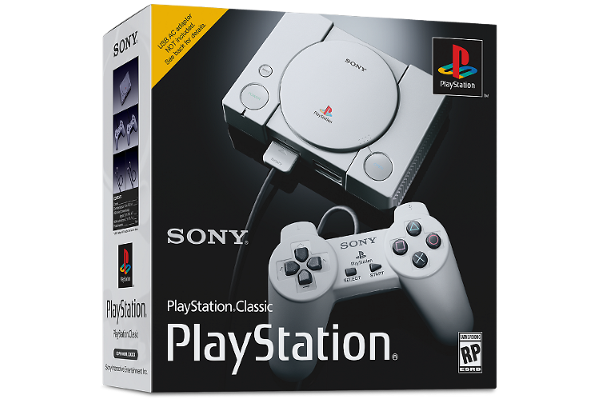 Today SONY announce that they are bringing back the original PlayStation experience in a new miniaturized version - PlayStation Classic! The console will come pre-loaded with 20 classic titles, including fan-favorites such as Final Fantasy VII, Jumping Flash, Ridge Racer Type 4, Tekken 3, and Wild Arms. Almost 25 years ago, the original PlayStation was introduced to the world. Developed by Sony Computer Entertainment, it was the first home console in video game history to ship 100 million units worldwide, offering consumers a chance to play games with real-time 3D rendered graphics in their homes. The mini console is approximately 45% smaller than the original PlayStation, and it emulates the original's look and feel by featuring similar controllers and packaging. Long-time fans will appreciate the nostalgia that comes with rediscovering the games they know and love, while gamers who might be new to the platform can enjoy the PlayStation console experience that started it all. All of the pre-loaded games will be playable in their original format. Featuring Final Fantasy VII, Tekken 3, Wild Arms and 17 other legendary titles, the new mini-console launches December 3 at an MSRP of $99.99 USD / $129.99 CAN. Available for pre-order at select retailers across the US and CAN, each unit will also come with an HDMI cable to connect to their TV, a USB cable, and two controllers for local multiplayer within compatible titles.